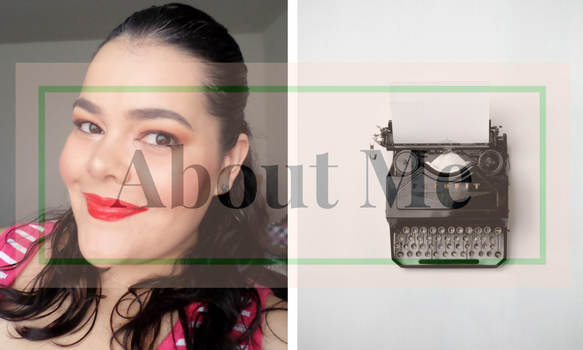 Today I want to share with you a little bit of information about me, why I started my blogging journey and how I ended up using the blogger platform. My name is Ivey. I'm a wife to my Jr. High School sweet heart and together we have 5 boys. The beauty world is something I've always had a passion for. Since I was a little girl I remember my mom applying makeup on me just for fun. I used to stand next to her every time she got ready, and watched how she applied blush and lipstick. She even gave me a few pointers. At night before going to bed I'd always enter her room just to find her removing her makeup with Pond's Cold Cream. My mom always told me that it was very important to remove your makeup and wash your face before going to bed. I just loved how sophisticated and beautiful my mom looked, and I wanted to be just like her. At twelve I stole my mom's favorite Estee Lauder dark brown lipstick that she was given as a gift. I remember going to school and being the only girl in my class wearing lipstick. It was such a dark shade of lipstick and I remember thinking yeah I'm cool. Many of my friends and class mates asked if my mom gave me permission. I obviously said no. My mom wasn't too happy, and she actually said, "you could have just asked for the lipstick." Although she wasn't happy that I stole the lipstick, she decided that it was okay to wear lipstick just not that specific color. She gave me the permission to wear light pink lipstick instead. Moving on, I remember in early 2008 seeing a commercial on TV about YouTube that featured Michelle Phan. I thought it was cool to see another person just like me share makeup looks. 4 Years passed and it wasn't after having my 5th child in 2012 that I really started to take care of myself. I guess having so many children and just focusing on them (not that it's a bad thing) you kind of forget that it's okay to put yourself first, and put on some makeup lol. I began watching beauty tutorials. After watching some of the more popular channels like Kandee Johnson, Emily Noel, and others talk about their favorite products, and reviewing them, I said to myself "I can do that." It took me about 4 months to actually believe in myself and finally start my blog. I was too shy to start YouTube so I thought a blog would be better. I started my blog on a free blogging platform via Word Press on March 8th, 2013. I started the blog with the same domain name I have now Precious 416 Blog with a similar tag line my favorite things, makeup, and more. I still remember that day like it was yesterday. I remember purchasing some products from Walgreen's and I was like, "you know what I'm going to talk about this today." It's funny because I just took a photo of the products and I posted it with a small description. The title read BOGO 50% Off Cover Girl Products At Walgreen's (or something similar to that). I didn't think anyone would read my post or my blog for that matter. I was so surprised when I saw my first like, and comment on that post. I got a total of 5 likes, and I gained about 2 followers. From there I started sharing quick 2 minute reviews via YouTube. I continue to share content there too, but blogging is more of my thing. After blogging for about 2 years I knew that it was something I was deeply passionate about. I wanted to take my blog to the next level so, around January 2015 I invested in what I thought was self-hosting. What I actually paid for is shared hosting, which is where many websites reside on one web server connected to the Internet. The first year was pretty great. I was able to customize my blog any way I liked. My monthly unique visitors numbers were going up, and that was really exciting because of that I also got more opportunities from companies. Unfortunately, after a year of "self hosting" I began to have difficulty with my blog. Around March 2016 to April 2016 I couldn't log into my blog or create content. I found out through my hosting company that another website under the same server was hacked, so my site ended up having issues because of that website. I didn't let the fact that my blog was down stop me from sharing my passion. I continued to share my thoughts on another platform, which is one of my favorite apps Instagram. It took about 2 weeks for things to get back to normal. The problem basically fixed itself. In June I decided to give my blog a brand new fresh look. I'm always playing around with designs, and tweaking here and there, but this time I changed themes. I loved it. My blog looked more professional and I really liked the layout. For 2 months everything was working and looking great. I created content, and shared my passion for the beauty world with no problems. Unfortunately, on or around August I had the same problem that started in March. I couldn't log into my blog and my site was down. I was so frustrated, and finally couldn't take it anymore. I decided that I would instead get my money back from my hosting site and forget about shared hosting. I lost all of my content because I had trouble downloading all of my information. That's 3 years of hard work and dedication that I put into my blog down the drain. I cried, but then I realized that I wasn't going to let that stop me from sharing my love for the beauty world. I remember I saw online ads about Google Domains. I did some research, and I decided to keep my domain name, which is Precious 416 Blog dot com. I thought about changing it so many times, but that name is everything to me. I will share another time why. I made the decision to join blogger and host my site for free. That meant I had to basically start over. It also meant that my numbers were going to go down, and I would end up with less opportunities. I always remind myself why I started my blogging journey and I realize that I truly am passionate about blogging and numbers will never define me. I'm now doing everything for free. I'm not paying extra for themes, or to self host. I just paid a small amount to transfer my domain name and that's it. The only time I'm spending money is when I want to buy a new product to try or if I feel like reviewing. Most of the products I buy is just because I want to try them anyway, I'm a true makeup junkie lol. This journey is fun, sometimes frustrating, and truly humbling, but I wouldn't change it for anything else. I love what I do! My passion is to share my love for all things beauty, and I hope that you join me and continue to read my blog. With that said I'm excited to tell you that I recovered some of my old content. I'm so happy! Starting today Friday November 4, 2016 I will be sharing some of my favorite beauty, skincare, and makeup posts that feature review, and makeup looks. These posts will also give you a taste of my writing style, and the things that I love. The posts will be called #FBF (flash back Friday's) and I will include the original dates of when they were first posted. I hope that you enjoy them!